Gilda Radner was a true comedic genius, a bright, bubbly person both as part of the original cast of Saturday Night Live and on her own. She was taken far too soon at age 42, the enormous talent silenced when it should have been at its apex. Love, Gilda is the chronicle of her life and career, a nice tribute to Radner's gift and a good introduction to those far too young to remember her. Using a wealth of archival footage from the Radner family, along with her various performances pre-and-post Saturday Night Live and interviews with both costars and current comic stars like Maya Rudolph and Bill Hader, we see Radner's journey. Starting out as the funny and fun-loving daughter in Detroit through her stint at the University of Michigan, Radner follows one of her many boyfriends to Toronto. There, she feels slightly suffocated until she returns to entertaining. She makes a splash at Second City comedy troupe, which sends her to New York where she has to work hard to get her own voice in. Then comes Saturday Night Live, where Radner was the first Not Ready for Primetime Players cast. The first few episodes were not a hit, but slowly, thanks in part to her characters such as sweet-but-addled Emily Litella and brash Rosanne Roseannadana made her a star. Despite that, she finds herself paying a heavy price for fame. That price is a sense of isolation both personally and socially. Looking back at old journals and photo albums, her sister and brother remark that Gilda couldn't see Ghostbusters because she had at one point dated the cast members save Rick Moranis. We also hear through Melissa McCarthy's reading of Radner's journals how once, she received the results of urine tests with a note attached. "It was an honor to analyze your urine", the note read in part. Yes, that is funny, but also indicative of how bizarre her world was. Then came marriage...and love. She marries G.E. Smith, the guitarist for her band, but then quickly falls in love with Gene Wilder, whom she costarred with in the perhaps appropriately-named Hanky Panky. Their efforts to be both parents and a new comedy duo led to the discovery that Radner had ovarian cancer. Love, Gilda chronicles her final battle, both her efforts to remain upbeat and her down moments up to the false hope that she had gone into remission. 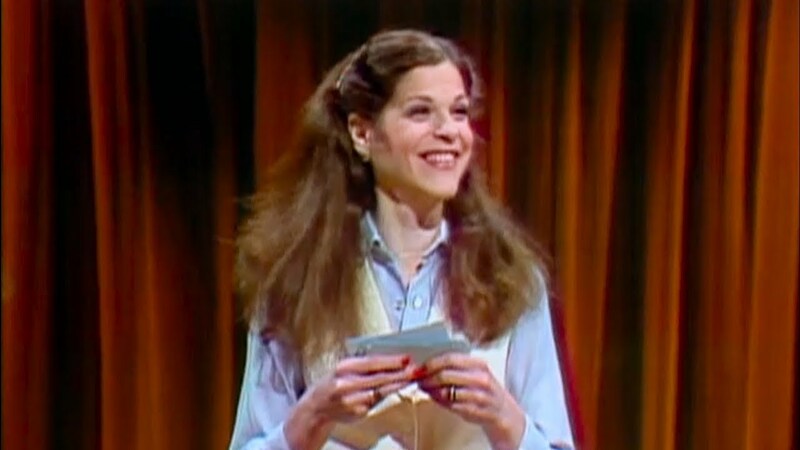 Love, Gilda has the positive of having Radner's own voice both metaphorically and literally thanks to both her journals and her audio-cassette recordings. Occasionally, Radner's successors in the comedy world such as McCarthy, Rudolph and Amy Poehler narrate her words, even adding some comments (McCarthy is shocked that someone would find urine analysis an honor). What we get in Love, Gilda is both a chronicle of Radner's extraordinary talent and the struggles professional and personal Radner encounters. What perhaps we don't get is more about said talent and/or struggles. In many ways, Love, Gilda is more a cursory look rather than say how she came about to create her legendary characters or her great love affair with Wilder (who died in 2016). Curiously, her marriage to Smith and the end of it due to her romance with Wilder is barely touched on. So is the failure of the Radner/Wilder film Haunted Honeymoon specifically and Radner's film career in general. It's not a slam on Love, Gilda, just an observation on the film. Despite that, even a cursory look at Gilda Radner is welcome, as Radner was a unique talent: funny, charming, talented and a very pleasant person who overcame much but sadly could not overcome her brutal illness. Love, Gilda is a celebration and recognition of this extraordinary comedienne who should not be forgotten. When it comes to Gilda Radner, we'll never say "Never Mind".